Total contact parts are of S.S. 316, and other surface parts are of S.S. 304. Manufactured with latest technology pneumatic based machine. Nozzle Lock system to stop dropping problems. No bottle No filling system. Bottle stopper and holder pneumatic based. Minimum change overtime, from one size to another fill size. Safety guard for conveyor gear box, motor and pneumatic cylinders. Inbuilt protection against over current, Voltage fluctuation, Short circuit in. Standard in quality & economical in price. Machine Direction Left to Right. Machine Dimension 1828 mm (L) X 910 mm (W) X 1220 mm (H). Production Speed 40 to 60 Bottles / Minute. 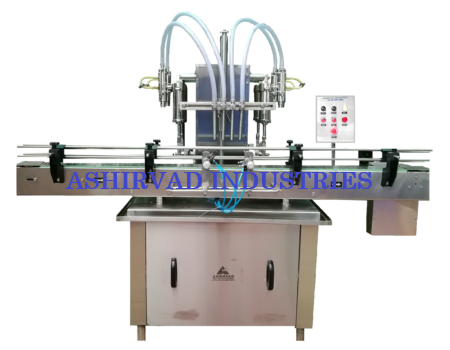 Machine filling range 10 ml. to 1000 ml. Filling Accuracy + 1% in single dose. Bottle Diameter Up to 90 mm. AC Drive 1 HP Single Phase.